By now, everybody’s probably heard of how thousands of homes in Detroit who were behind on their water bills have had their water shut off. If you follow us, you’re probably more informed than most on the matter, as we’ve run three pieces recently on the DWSD and how the shutoffs are impacting Detroit residents. We’d like to think that Mayor Duggan will be able to bring this horrible situation to an end, and that this all isn’t just a play to shift blame away from the Emergency Manager’s office. Only time will tell. This entry was posted in Civil Rights, Economics, Government, Income Inequality, Privatization, Social Justice, Solidarity, Water and tagged Capitalism, Economics, Income Inequality, Water on July 31, 2014 by ew. We’ve written about workers’ rights on a number of occasions. Whether it’s about safety on the job, the right to organize and collectively bargain, the concept that everyone working full time should earn a wage they can live on, gender/pay discrimination, or other topics we’ve touched on, it’s a topic near and dear to our hearts. Well, something happened yesterday which, if upheld, will be seen as a turning point in the labor movement of the twenty first century. Labor organizers have long argued that McDonald’s should be held accountable as a joint employer because of the control it has over menus, uniforms, supplies and many other terms of operations. While yesterday’s ruling stemmed from older claims dealing with workers being fired from franchises when they attempted to unionize, it would logically also apply to the current class-action suits dealing with wage theft by certain franchise owners. Wilma Liebman, a former chairwoman of the National Labor Relations Board under President Obama and now an occasional consultant to unions, said the decision could give fast-food workers and labor unions leverage as far as getting the company to negotiate about steps that would make it easier to organize McDonald’s restaurants. She also said that the ruling could give the workers and unions more clout in pressing McDonald’s to have its franchisees raise wages. This entry was posted in Demonstrations & Protests, Economics, Government, Human Spirit, Income Inequality, Social Justice, Solidarity, Unions and Organized Labor, Workers' Issues and tagged Capitalism, Economics, Income Inequality, Unions on July 30, 2014 by ew. We’ve talked a lot about pipelines and the fact that they leak. All pipelines will leak; it’s just a matter of when and how much they do. And, while we’ve been focusing on the leaks we can see (oil is pretty noticeable, after all), what about the ones we can’t? Last Friday, Rick Beusse, Erica Hauck, Kevin Good and Richard Jones of the EPA’s Inspector General office published a report stating that in 2011, more than $192 million worth of natural gas was lost due to leaks in pipelines. This, of course, resulted in higher prices paid by the consumer, as well as potentially having serious environmental impact. Up to now, the EPA has had a program that encourages natural gas companies to reduce their methane emissions voluntarily, but doesn’t require them to do so. Needless to say, as in most self-regulating schemes in the oil and gas industry, it hasn’t worked. “While the Natural Gas STAR program has been successful in reducing methane from other segments of the industry, this voluntary program has achieved limited reductions from leaking distribution pipelines, due largely to financial and policy barriers. For example, LDCs [local distribution companies] generally have had to bear the upfront capital expenditures to repair leaks, while the savings from these repairs have accrued to the consumer, thus creating a disincentive for LDCs to repair non-hazardous leaks. Along the same lines, BlueGreen Alliance released a report earlier in the week recommending that the U.S. replace pipelines every 10 years, rather than every 30. 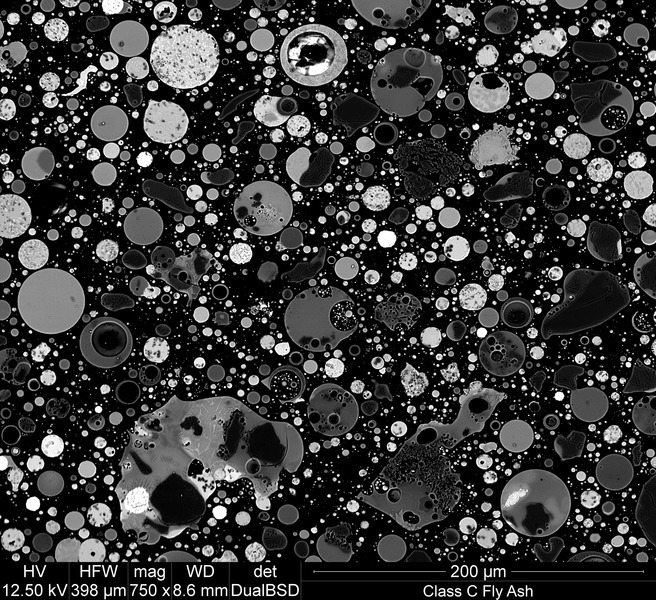 This makes sense, as methane leaks typically occur in older pipelines made of cast iron or unprotected steel, which are more prone to cracking and corrosion. These are just the latest in a number of recent reports warning about major methane emissions from the natural gas sector and/or criticizing the EPA for not doing enough to curb methane emissions. A Cornell University study from earlier this month states that 40 percent of the oil and gas wells in parts of the Marcellus shale region will probably be leaking methane into the groundwater or into the atmosphere, and a study released in May by the University of Colorado at Boulder found methane leaks from oil and gas development in Colorado were three times greater than they had been predicted to be by emissions inventory estimates. 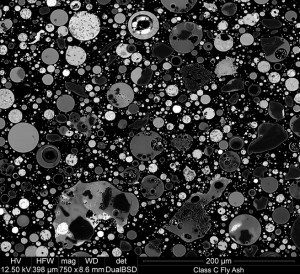 And in May, two Cornell researchers said the EPA is drastically underestimating the potency of methane, and that not enough is being done to reduce methane emissions in the U.S. This entry was posted in Climate Change & Environmental Issues, Economics, Energy, Fracking, Government and tagged Economics, Energy, Fracking, Hydraulic Fracking, Oil, Pipeline on July 29, 2014 by ew. 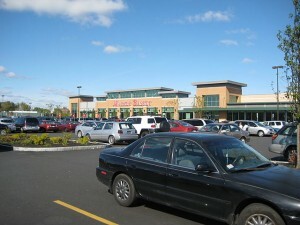 Market Basket’s flagship store in Chelsea, MA. Photo by Cybah (own work), public domain. 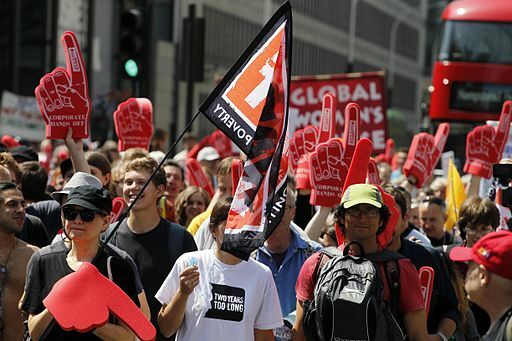 We often read about workers striking to protest a CEO’s policies. But, how often do you hear about a company where the workers are out on strike to protest a CEO’s firing? And, how often do you hear about customers joining the picket lines, or 100 state legislators and mayors supporting the boycott? Say hello to Market Basket. 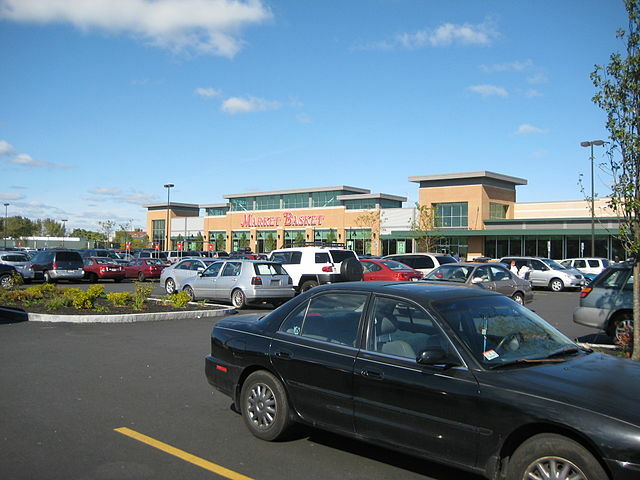 Market Basket is a chain of 71 supermarkets in New Hampshire, Massachusetts and Maine owned by the Demoulas family. The current situation is the result of a power struggle between two cousins; Arthur T. Demoulas, the former CEO and a 40 year employee, and Arthur S. Demoulas, who works for an investment capital firm in Boston. Up until last year, Arthur T. had been in control of the board of directors. Since 2008, sales had grown from just under $3 billion to over $4 billion per year, and the number of employees had grown from 14,000 to 25,000. He was popular with his employees. Then last summer, Rafaela Evans, a woman living in London who was once married to one of Arthur S. Demoulas’s brothers, switched sides and began voting with the Arthur S. faction. This led to Arthur S. holding the majority. There’s nine people who hold shares in the company; all of them either descendants or in-laws of descendants of the two brothers who originally founded the company. So, what was one of the first things the new board did? They voted to give themselves a $300 million special dividend, even as Arthur T. warned against doing so. They also replaced two of the three trustees overseeing the very popular employee profit sharing program. In June of this year, Arthur T. was fired From Market Basket. Two other executives were also fired, leading to seven executives with a combined 277 years with the company quitting in protest. An estimated 300 employees rallied outside a store in Chelsea, Massachusetts in solidarity with Arthur T. and the other fired executives. The protests spread. Then on July 18, warehouse workers walked off their jobs in protest. On July 20, eight longtime workers with a combined 280 years with the company were fired. The new co-CEOs cited “significant actions that harmed the company and therefore compromised Market Basket’s ability to be there for our customers” as the reason for the firings. Then this Friday, an estimated 10,000 supporters gathered at the Tewksbury location. The new co- CEOs; Felicia Thornton, a former executive of the grocery chain Albertsons, and Jim Gooch, former president and chief executive at RadioShack Corp, made statements assuring workers that they are not planning drastic changes in the way the company is operated, and they urged employees to return to work. Meanwhile, on Wednesday Arthur T. (remember him? He’s who this whole thing is about) offered to buy the company. Occupy World Writes stands in solidarity with the employees of Market Basket, and with Arthur T. We applaud them for standing up for their former boss, and applaud him for putting happy employees, satisfied customers and a fair profit over maximizing profits and to hell with the rest. This entry was posted in Demonstrations & Protests, Economics, Human Spirit, Solidarity, Workers' Issues and tagged Capitalism, Economics, Protests on July 28, 2014 by ew. 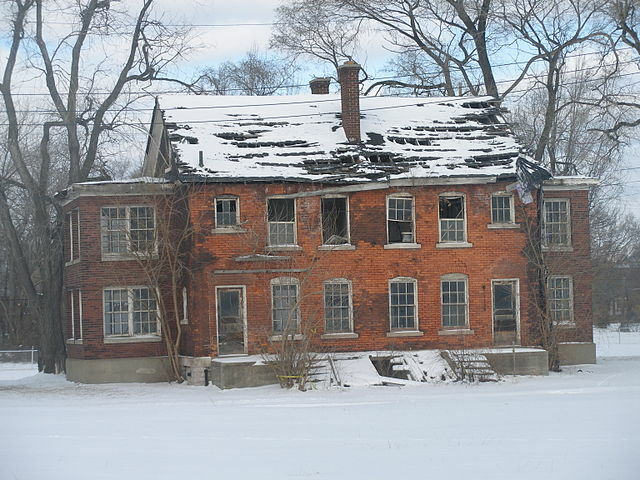 Fort Wayne Officers Row, Detroit. 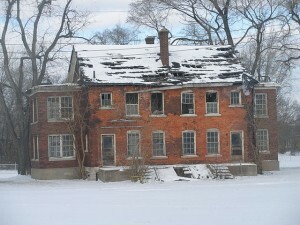 Photo by MJCdetroit via Wikimedia Commons. We’ve talked about the water crisis in Detroit before; first when a coalition of activists filed an appeal with the United Nations Special Rapporteur on the Human Right to Safe Drinking Water and Sanitation over the Detroit Water and Sewerage Department (DWSD)’s cutting of water and sewer services to thousands of households, and again when a United Nations team of experts agreed with the activists. On Monday, the DWSD announced that it would suspend shutting off water for fifteen days to Detroit residents behind on their bills. However, this is only talking about new shutoffs; it does nothing for the 15,200 households who’ve already had their water shut off. Then, there’s the target of the shutoffs. When the shutoff program was announced in March, the DWDS claimed they were going to cut off everybody who was $150 or 60 days in arrears. However, the shutoffs have disproportionately targeted poor residents and left businesses alone. The biggest debtor? The state of Michigan itself, which owes over $5 million in water bills. The top 40 commercial and industrial accounts have past-due accounts totaling $9.5 million. In all, commercial and industrial accounts owe in the neighborhood of $30 million, yet they’ve for the most part been exempt from the shutoffs. And, due to layoffs in the DWDS itself, they’ve had to hire a private demolition company to do the shutoffs, at a cost of $5 million. 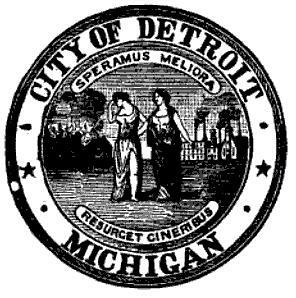 Of course, none of this could happen if Detroit wasn’t under “emergency management.” Under the Local Financial Stability and Choice Act, the governor may appoint an Emergency Manager, who is essentially a de jure dictator of a local government and/or school district during a fiscal crisis. If you were following the 2012 elections, you might ask yourself; “Hold on- didn’t Michigan voters repeal the emergency manager law?” Why, yes; they did. However, Rick Snyder and the Michigan legislature pushed a bill through during a lame duck session that essentially mirrors the old law, but with one huge difference; this one can’t be repealed by the voters. So, what can be done to stop the madness? Some residents have been turning their water back on after the DWSD shuts it off; an action which could cost them $250 if caught. Being caught a second time carries a $500 fine, and a third time supposedly results in a permanent shutoff. This is obviously not a long term solution. Enter the Detroit Water Project. The Detroit Water Project allows people who wish to help pay a delinquent family’s water bill do so by matching them anonymously with a family who needs help. They emphasize that any help goes a long way. The project’s already pulled in more than 1,600 donors in the week that it’s been active. Occupy World Writes stands in solidarity with the people of Detroit. We applaud the Detroit Water Project, and encourage anybody who can donate to it to do so. We call on the DWSD to extend their moratorium on residential shutoffs, and for them to instead target the real delinquents; the commercial and industrial accounts. And finally, we call on the people of Michigan to vote in November and elect a government that works for the good of its residents, and not for the good of business at the expense of the residents. This entry was posted in Civil Rights, Corporate Personhood, Demonstrations & Protests, Elections, Government, Human Spirit, Income Inequality, Privatization, Solidarity, Water and tagged Democracy, Economics, Income Inequality, Protests, Water on July 27, 2014 by ew. Less Bang For The Buck? Earlier this month, we ran a piece about the sharp increase in explosions, fires and other accidents involving trains carrying oil, and how we’ve seen more oil spilled in rail accidents in the last year than in the previous 35 years combined. This has led to the federal government requiring that railroads carrying more than 1 million gallons of highly flammable oil from the Bakken oil field in a single train – about 35 tank cars – disclose details of volatile oil shipments to the states. This week, the Obama administration proposed new regulations on the safe transportation of flammable liquids. The proposal includes such things as better classification of mixed gases and liquids, rail routing risk assessments and disclosure of train details as mentioned above and reduced speeds. As far as improvements to the trains themselves go, the proposal includes better braking capabilities and sturdier tank cars. Under the proposal, the DOT-111 tank car, which is the type most involved in spills, would be phased out or rebuilt to the new standards over a two year period. There’s three possible standards for the tank cars; the sturdiest of which would add $3 billion to transport costs over the next twenty years. However, it could also save $3.5 billion from avoided damage and death caused by accidents. So, this all sounds good, right? Not really, if the truth were to be known. To begin with, the new regulations wouldn’t go into effect until October 1, 2015. Between now and then, all of the oil transported by rail will be in cars that have been deemed to be unsafe to transport Bakken crude oil. And, after that they’d have an additional two years to phase out or rebuild the cars. Note that the proposal only calls for phasing out the DOT-111s for packing group I flammable liquids. Liquids classified as packing group II or III could still be shipped via DOT-111 cars. 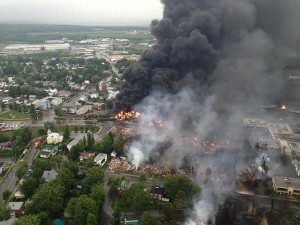 Tests of the oil from the Lac-Megantic disaster revealed that the oil should have been classified as packing group II. Under the new proposal, the Lac-Megantic train would be in compliance. “Today the Obama administration announced weak new standards for high-hazard flammable trains that give the oil industry a license to threaten the safety of millions of Americans and leave communities and emergency responders holding the bag. He also said that the administration needs to “go back to the drawing board and put public safety first.” We couldn’t agree more. Occupy World Writes feels that the flaws in the proposed regulations are both obvious and dangerous. We encourage all to comment on the proposal when the 60 day public comment period starts; the proposal isn’t listed yet on regulations.gov. Rolling bombs are not acceptable in our communities. This entry was posted in Climate Change & Environmental Issues, Economics, Energy, Government and tagged Economics, Energy, Environment, Fracking, Hydraulic Fracking, Oil, Oil Shale on July 26, 2014 by ew. We at Occupy World Writes talk a lot about water, and with good reason. Our planet’s most valuable resource is water. We need it to stay alive; plants and animals need it. Our industries need it. Almost everything we do or consume uses water somewhere or another. We’ve talked about industries polluting our water, but we haven’t really discussed what’s happening with our water otherwise. The U.S. has been suffering drought in one place or another since at least the turn of the century. The Colorado River basin has been especially hard hit, The U.S. Bureau of Reclamation, which is the federal water management agency, says that the basin has been suffering from prolonged, severe drought since 2000 and has experienced the driest 14-year period in the last hundred years. A new study by scientists at NASA and the University of California, Irvine finds that more than 75 percent of the water loss in the Colorado River Basin since late 2004 came from underground resources. Using data gathered by NASA’s Gravity Recovery and Climate Experiment (GRACE) satellite mission, they tracked changes in the mass of the Colorado River Basin, which are related to changes in water amount on and below the surface. Monthly measurements of the change in water mass from December 2004 to November 2013 revealed that the basin lost nearly 53 million acre feet (65 cubic kilometers) of freshwater. This is almost double the volume of Nevada’s Lake Mead, the nation’s largest reservoir. More than three-quarters of the total — about 41 million acre feet (50 cubic kilometers) — was from groundwater. The Colorado River is the only major river in the southwestern United States. 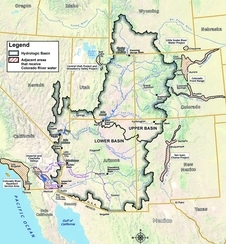 Its basin supplies water to about 40 million people in seven states, and irrigates roughly four million acres of farmland. I was having a conversation around five years ago with a friend of mine who lives out in LA. He’s what many people would call a futurist; very bright and always looking ten to twenty years down the road. The subject was what we considered to be the biggest limiter or threat to California’s, and hence, to a large extent, the U.S.’s economy in the next ten years. He said not enough energy, and I said not enough water. I’m sorry to say it looks as if I was right. This entry was posted in Agriculture, Climate Change & Environmental Issues, Privatization, Social Justice, Water and tagged Capitalism, Economics, Environment, Water, Water Conservation on July 25, 2014 by ew. We at Occupy World Writes cover many different topics. If you’ve been following us, you’ve probably noticed that every once in a while two or more topics that we’ve been covering suddenly merge into one through some piece of news that we’ve picked up and reported. Today is one of those times, and it combines two of our favorite topics; Canadian tar sands oil and the TTIP. TTIP is the Transatlantic Trade and Investment Partnership. We covered it briefly in one of our very first posts. And, while its sister agreement TPP (Trans Pacific Partnership) has received much more coverage both here and elsewhere, the TTIP is just as egregious, if not more so, in the way it tosses out national laws and human welfare concerns in favor of corporate interests. The FQD as it presently stands calls for a six percent reduction in the emissions of transport fuels by 2020. But, in 2011, the E.U. proposed that tar sands and other unconventional oils be recognized as having higher greenhouse gas “intensity” than conventional oil, given that they require more energy to produce – a 23 percent higher intensity, according to a study done for the European Commission. Needless to say, if the E.U. puts the FQD into place, there would be a very limited market for tar sands oil, due to the additional greenhouse gas emissions over other energy sources. Hence, the U.S. negotiators prefer a “system of averaging out the crudes”, meaning that all forms of oil would simply receive one median score regarding their emissions intensity. This would effectively kill any E.U. restrictions on unconventional oils, and add an additional 19 million tons of carbon dioxide to the atmosphere, according to a Friends of the Earth study. With some $150 billion invested in Canadian tar sands by the major oil companies between 2001 and 2012, it’s easy to see why the oil companies would be pushing for this. The U.S. was once seen by investors as the logical market for the tar sands oil, but due to both a lessening dependence on oil (and imported oil in particular), and growing public skepticism towards the pipelines and other means of transporting the oil, a different market needed to be found. Unfortunately, the secrecy and non-transparency seems to be the one recurring theme during the TTIP and TPP negotiations. Wouldn’t you think that if these agreements were to benefit the normal citizen, you’d hear constant jabber in the media about it? When (if ever) was the last time you heard any coverage by the mainstream media about it? This entry was posted in Climate Change & Environmental Issues, Economics, Energy, Government, International Agreements, Mining and tagged Canada, Economics, Energy, Environment, International Agreements, Oil, Pipeline, Tar Sands, TTIP on July 24, 2014 by ew. On February 2 of this year, Duke Energy, the largest electric power holding company in the United States, spilled 39,000 tons of coal ash into the Dan River in North Carolina. We wrote about the spill shortly after it happened, and questioned how well it would be cleaned up. So, how’s the cleanup going? Last Thursday, the EPA and Duke Energy both announced that the cleanup was complete. However, Duke has only cleaned up approximately 2,500 tons that had piled up against a dam in Danville, Virginia. Duke and the state regulators say they will continue to monitor the river. Brian Williams of the Dan River Basin Association probably put it best: “This stuff is not just going to go to the bottom and stay there and not harm the environment. It will be an issue for many, many years to come.” We can’t help but agree with that assessment. This entry was posted in Climate Change & Environmental Issues, Economics, Energy, Government, Mining, Water and tagged Coal, Economics, Energy, Environment on July 23, 2014 by ew. Occupy World Writes extends our deepest condolences to the families and loved ones of both MH17 and the killed and injured civilians of the Gaza Strip. We are appalled that through the course of these tragedies, a humanitarian recognition to set differences aside is outweighed by any other agenda. This entry was posted in Human Spirit, Solidarity and tagged Gaza Strip, MH17 on July 22, 2014 by MNgranny.